Mrs. Tighe’s 2nd Grade Class raised Monarch butterflies earlier this year and recently released them. The second graders got to witness first-hand as caterpillars hatched, grew, and transformed into butterflies. Now these second graders are racing the butterflies. 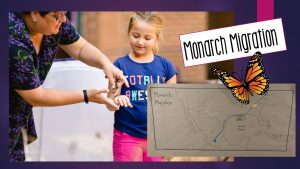 They learned that each year the butterflies migrate to Mexico, travelling 2, 337 miles from Williamsburg, VA. And so, they are trying to “beat” them there. Each student wears a pedometer daily. They add up the class’ steps each day and keep track of how far they have walked. 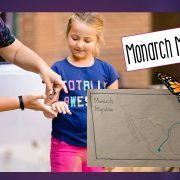 Right now it is a close race, both the Monarchs and Mrs. Tighe’s Class have traveled far enough to reach Georgia. What an exciting journey they are on together. We are halfway through the first marking period, and the school year is off to a great start. I hope the transition back to school has gone smoothly for your family, particularly those of you who are sending a child to school for the first time. The students seem to have adjusted well and are learning classroom and school procedures and routines. We are looking forward to a successful year! It was nice seeing so many of you at Back to School Night. I hope you found the evening enjoyable and informative. Communication between home and school is key to your child’s success. Information about your child’s academic performance and classroom activities can be found in ParentVue. Directions for navigating this site can be found on the D.J. Montague homepage at https://wjccschools.org/djm/. Please contact the school if you are unsure of your log in information. The D.J. Montague Family Handbook that was sent home the second week of school also contains important information. If you haven’t taken time to read it, I encourage you to do so. If you have lost the handbook, you can access it on the D.J. Montague website under the Students and Families tab. The staff is working hard to keep the carline moving to minimize congestion in the parking lot in the morning and at dismissal time. Please help us by pulling to the top of the carline, yielding to cars pulling out of the circle if you are driving through the parking lot to park and if there is space, yielding to buses exiting the bus loop. Our Fall Celebrations will be taking place on October 31st. Due to the increasing number of students with food allergies, we ask that no home baked goods or items prepared at home be brought to school. Items should be store bought and have an ingredient list on the package. Our school nurse will review the ingredient list to ensure that the treats are safe for all students in the class to enjoy. In accordance with the Wellness Policy, if you will be providing food items, we would like to include healthy options such as fruits and vegetables with the traditional “sweets.” If you plan on bringing fruits and vegetables, we ask that the items be brought to school and the trays prepared here. A “kitchen” will be set up in the conference room for this purpose. Thank you for your help in making this a safe, special day for our students. On Tuesday, October 31st beginning at 2:00 PM, we will continue a longstanding D.J. Montague tradition, the Halloween Parade. Students in grades K – 2 will parade around the bus loop in costume as the rest of the student body, staff and parents look on. In order to ensure the safety of the students during this event, the entrance to the school will be closed at 1:45 PM. If you are planning on attending, make arrangements to arrive before this time, otherwise you will need to park on Centerville Road. Additionally, due to limited space and preparation time, we ask that our families please not enter the hallways or classrooms prior to the parade. After the parade, each class will move to a specific location for pictures. After this photo opportunity, students will return to the classrooms. For those of you who will be taking your children home after the parade, classroom teachers will have a sign out sheet in the classrooms. PLEASE do not take your child from the parade site. You will receive more specific details about this event from your child’s teacher. It is important that we work together to make this school year a successful one for your child and your family. If you have any questions or concerns, please don’t hesitate to contact me at catherine.vazquez@wjccschools.org or 757-258-3022. On October 4, DJM participated in the Crunch Heard ‘Round the Commonwealth, an event where all participants simultaneously take a bite out of a locally-grown apple. 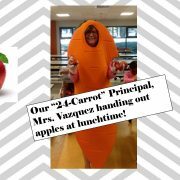 Mrs. Vazquez, our 24-“carrot” principal dressed up as a nutritious carrot and passed out apples to all the smiling students and staff members in the cafeteria that day! This day is part of Virginia Farm to School Week, scheduled for October 2-6, 2017 to coincide with National Farm to School Month. 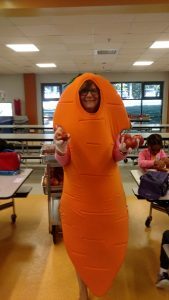 This year, the VDOE is encouraging schools and education centers to “Make some Noise for Virginia Farm to School Programs” to recognize the importance of these programs in improving child nutrition, supporting local economies, and educating students about the origins of food. 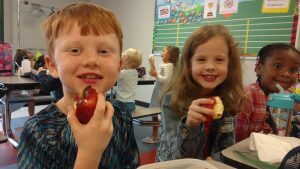 Virginia school divisions typically celebrate by featuring locally-procured foods on menus, organizing school garden parties, taking field trips to local family farms, hosting poster contests, inviting guest farmers to classrooms and cafeterias, and engaging in other related educational activities.